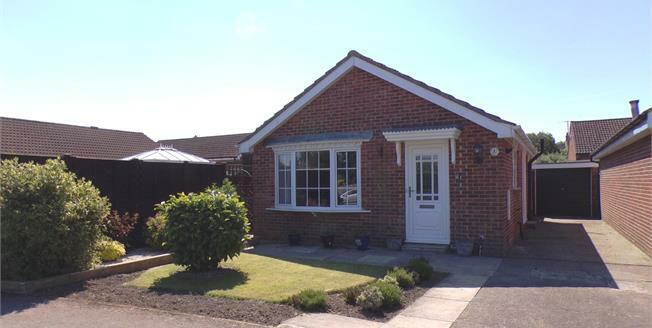 An extended detached bungalow in a very desirable area of Morton-On-Swale, offering light and spacious living accommodation with beautifully maintained gardens, detached garage and offered to the market with no onward chain. In brief the property comprises of, entrance hallway, living room, kitchen/dining room, shower room, master bedroom with doors leading out onto the garden and a further bedroom. Externally the property is well positioned on the plot offering beautiful landscaped gardens and detached garage. Double glazed door. Built-in storage cupboard. With double glazed bow window facing the front. Feature fireplace incorporating an electric fire and radiator. With a good range of wall, base and drawer units, with contrasting work surfaces, stainless steel sink, integrated oven, microwave oven, electric hob, over hob extractor, space for dishwasher, space for washing machine and with French doors and double glazed window to side aspect. Double glazed window facing the side. Heated towel rail, tiled flooring. Low level WC, single enclosure shower, vanity unit and inset sink. Double bedroom; patio double glazed door, opening onto the garden. Radiator, a built-in wardrobe. Double bedroom; double glazed window facing the rear overlooking the garden. Radiator.